Welcome to Markson Pianos - "Quality at the Right Price"
London's famous piano store, founded in 1910, is a third-generation family business. 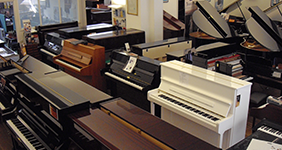 We specialise in the sale and hire of new and secondhand (pre-owned) acoustic and digital, upright and grand pianos. We aim to offer good value for money, expert advice and unparalleled after sales service through the essential ingredients of a superb selection of pianos for sale and hire. Our services include hire, maintenance, restoration, removal and tuning, together with supplying you with the latest technology the music industry has to offer, such as retrofit self-playing mechanisms and silent systems. 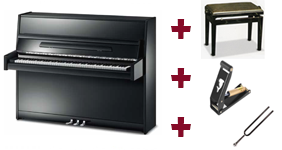 We specialise in long and short term piano hire in London, the south east and the UK. At Markson Pianos we are proud to cater for all your piano needs and our professional, dedicated and experienced staff reflect the service and knowledge we offer our customers. My piano teacher suggested Markson Pianos when I decided to buy a new piano, so I visited their showroom. They were very helpful and importantly also left me alone to wander around and play all the pianos for as long as I liked. I was given a very competitive price and they must have moved heaven and earth to get my Hoffmann Grand piano to me in a WEEK from Germany. It arrived exactly on time, with no hassle and I am absolutely delighted. The First Steps - Q & A Acquiring a piano is not as complicated or daunting as it may first appear, but there are some questions you should address at the outset. Buying or Hiring ? Acoustic or digital ? 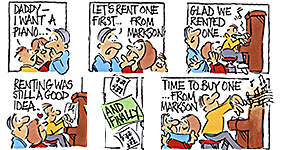 New or secondhand ? In May 2019 we will be introducing the range of pianos from the prestigious, German based manufacturer, Grotrian. Since 1835, this now fifth, and sixth generation family business have been making pianos adhereing to the mantra of Wilhelm Grotrian "Lads, build good pianos and the rest will take care of iteself"
This is a free program available from the Adobe web site. Follow the download directions on the Adobe web site to get your copy of Adobe Acrobat Reader.